Who ever said that getting there is half the fun is hugely wrong. Getting there or anywhere in China, alive, is the best part. Our young rookie cab driver testing it out. Officially there is one death every seven minutes (in China). Road crashes cost 1 percent to 3 percent of the country’s GDP every year. China, with four times the population of the United States, has today only one-third the number of vehicles and yet it has twice as many deaths because of road crashes. —Per article in China Daily titled “Make road safety the new traffic mantra” written by The World Bank transportation specialist Deng Fei. I began writing my last major piece on my trip to China about our visit to lovely, picturesque Zhou Zhuang, one of the oldest water villages in all of China, when I realized that there is way more to the story than a simple post. Instead of one post it would take three. For I forgot one of the golden rules of travel: Travel itself. Truthfully said, in China, travel is a life or death situation. Getting anywhere alive is a big thing, no joke. Thus as much as I had intended to wrap up my China series with a few quick and easy posts and move on to other parts of the world such as New Zealand, I am stuck here for now telling this crazy story about our visit to a Chinese Water Village. Hope you enjoy! The pretty Chinese Water village will have to wait….until the next post. For we need to start the story with the basics: Getting there alive. China’s roads kill without mercy. Traffic accidents are the major cause of death in China for people aged between 15 and 45, and the World Health Organization estimates there are 600 traffic deaths per day. At long-distance bus stations across China you may be subjected to posters graphically portraying victims of road crashes; then when you get on the bus you find there are no seat belts. If you insist on wearing a seatbelt everyone looks at you as if you are insane. After reading this review of traffic safety in China, I felt that surely the most dangerous part of the trip wouldn’t be the flight over or getting randomly, fatally attacked by some crazy Chinese guy with a knife (unfortunately this did happen to Mr. Bachman, a fellow Minnesota and CEO of Bachmans, during the Chinese Olympics). No sir. The most dangerous part of the journey would be the driving and it was something I wasn’t looking forward to. Remember this? From my Beijing post on Hutongs? 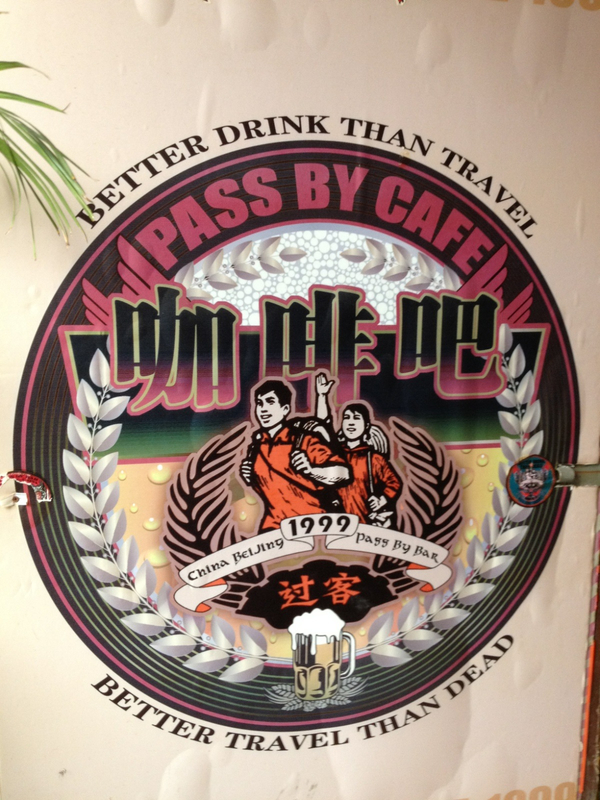 It was the motto from the Passby Cafe. A rather fitting motto in this case! 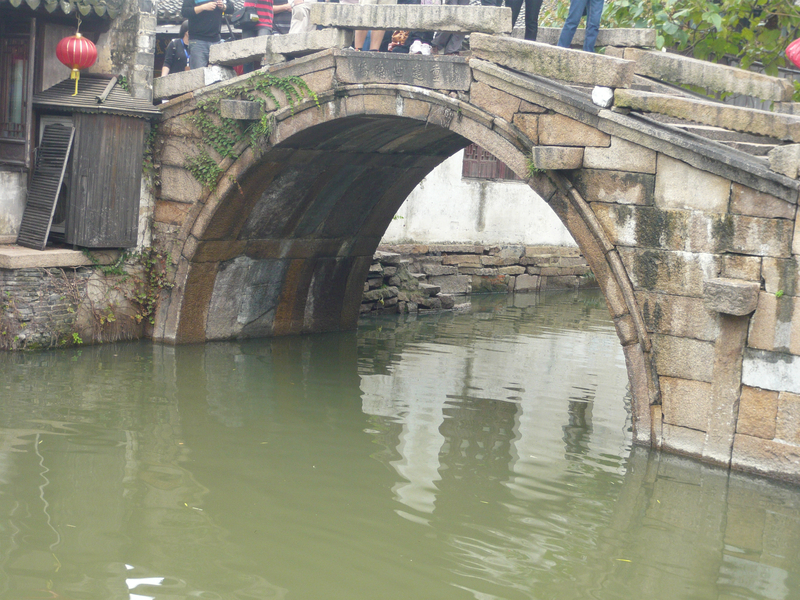 So here is the story, Our Trip to a Chinese Water Village: Part I Getting There. Our last full day in Shanghai was my one attempt to get out of the big city and see something different. I had heard about the numerous traditional Chinese water villages and wanted desperately to check one out. It sounded idyllic. Romantic canal-filled villages dating back well over 700 years. I mused: What could be more representative of China than a water village? But once again, the descriptions in Lonely Planet and on our hotel’s tourist brochures were not promising. Over and over again I saw the words “hordes of tourists“, “masses of tour buses“, “huge groups of wall to wall camera-clad people bumping into each other” and worried that a visit to a Chinese Water Village would be just another tourist trap. Of course the two lovely young Chinese ladies at our hotel’s concierge desk strongly encouraged that we take a tour. I tried to smile at her politely and tell her that my dad and I are not the “tour bus” kinds. We despise being herded like cattle, chasing after a petite Chinese woman while pushing and shoving our way to the front through the swarm of fellow tourists all wearing our matching tourist hats. No thanks. Not for me. So, of course we had to be creative and after such a great experience going without a tour group to the Great Wall, we believed we could probably have a similar experience going to a water village the same way: By hiring our own private guide and ride. After twenty minutes of negotiations with the friendly hotel staff, our guide was booked and the price was determined. We were to meet her down in the lobby at precisely eight am and our driver, a hired taxi cabbie, would be there to meet us as well. It all sounded like the perfect day….ahhh….but of course it wasn’t perfect. Nothing ever is when you are traveling half-way across the world in a completely different culture! We met Gloria, our guide for the day, in the hotel lobby drinking a cup of tea well ahead of our scheduled rendezvous. Gloria was well-dressed and wore bright lipstick that matched her dignified, professional appearance. She proudly shook our hands and informed us that she was a veteran tour guide with over ten years experience conducting private tours throughout Shanghai. She also added that she was trained by Shanghai’s Tourism Institute and was the first in her family to go to college and have a professional degree. We were instantly impressed by her knowledge and fluent level of english. It was so nice to be understood and to understand someone in China for once! We left our hotel promptly at eight and were greeted by a mediocre taxi cab. The driver opened the door and looked relatively young (remember, I’ve just turned 40 recently so now anyone in their early twenties looks like a puppy to me!). He spoke no english, was a chain-smoker, and had a mischievous look in his eyes. My heart plummeted. All I could think about was those frightening articles I’d read, about traffic deaths. We took off in heavy Shanghai traffic. Gloria informed us that Fridays were always bad because all the factory workers were headed home. Apparently the stop and go madness we were in was nothing compared to the five pm rush. We would have to make sure we left the water village by two in order to beat any traffic jams and heady delays. I noticed immediately that neither the taxi driver nor Gloria put on their seat belts. Perhaps I am a bit of a freak in this sense, but I ALWAYS wear my seat belt at home, even in the back seat and especially in a cab. This person is responsible for my life, dammit! I’m not going to trust some random stranger! I had to struggle a bit to find the actual seat belt. After five minutes of searching inside the worn seat back I finally found it. Unfortunately my dad didn’t have one. There was no way of buckling in so he simply shrugged his shoulders and held on. 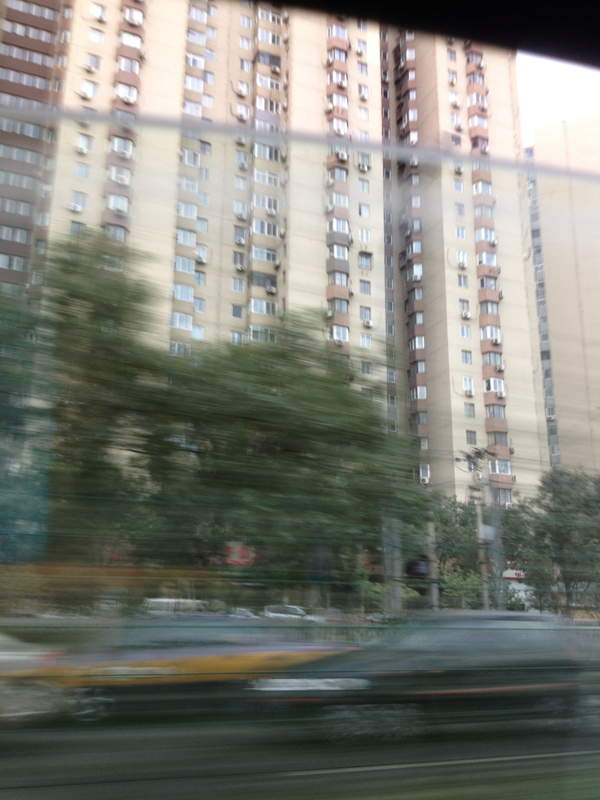 As we drove out of the outskirts of central Shanghai and finally passed through the slow-moving traffic, the highway magically seemed to open up and empty. To my dismay, the taxi driver used the open road (I swear if he could speak english he would be saying “the highway is the limit, baby!” ) and started to increase his speed. Our tour guide Gloria continued to dictate the history of Shanghai and the water village, while I felt my skin prick and my hands become clammy. Before I knew it, the driver put “the pedal to the medal” and was racing at insane speeds of 85 to 90 mph!!!!! I nearly had a heart attack!!!!! But Gloria continued to talk calmly, like nothing was the matter and I swear to God the driver was smiling. Our young rookie cabbie swerved in and out of traffic and even passed cars and trucks on the shoulder! I nearly threw up! I started to see my life flash by me and thought of my adorable, sometimes driving me crazy kids and my wonderful husband back at our warm cozy home in Minneapolis. My heart beat faster and faster yet no one else seemed the least bit alarmed. Not even my dad. Hmmmm…..am I really getting old? But then I remembered the frightening statistics: Someone dies every seven minutes in China on the road. I didn’t want that someone to be me! So I let my voice be heard and begged the cab driver to slow down via Gloria of course. And thankfully he did. He was off his joy ride. But we still had another hour to go…. Would we get there alive? Stay tuned….. to find out the rest of the story with part 2! This makes me think of the opposite situation. A couple of years ago I took a cab from the airport home. I should have been suspicious when it was a woman driving the cab, but a man’s picture on the license posted on the side. My guess now is that she was his wife and trying to pick up some extra money. She went about 30 KM an hour on the elevated highway at 11pm. I thought I was also going to die – but because someone else would rear-end us because the speed was so slow that others were swerving around us. The final straw was when she almost missed the exit to get off the elevated road. I started protesting voraciously and forced her to exit. It’s at times like these when my chinese ability really comes in handy. Thanks for sharing – it made me remember that unique – yet frightening time! so it never happens, even if it would make the roads safer. Glad you were able to use your voice and yell at this woman! Crazy story! Thanks for sharing! Sounds like the roads in Italy. Glad you made it out in one piece. So Italian roads are equally bad? Crazy isn’t it! Compared to living in the Gulf and in particular when travelling in Egypt – China’s roads just aren’t all that frightening. Driving here is so much better than in the Arab world that I barely notice the “near misses” anymore. I once saw a Saudi pull a u-turn on a 6 lane highway, so he could travel back 6 km to the exit he’d missed rather than turning round at the next exit. Wow, you mean to tell me that the roads and driving is worse in the Gulf?! I guess I feel jaded after reading the book called Country Driving, about driving in China! Glad the driver was willing to slow down when you begged. Regardless, I know that ride had to have been crazy. Driving is nuts in Vietnam and India, as well. And, actually, Haiti isn’t much better. Hope you having a great weekend, Nicole.